STEFF Automatic Power Feeders are manufactured by Maggi Engineering in Certaldo, Italy. 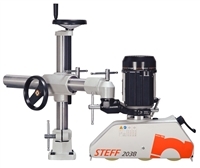 The STEFF brand has always been the dominant name in power feeders for the woodworking industry. 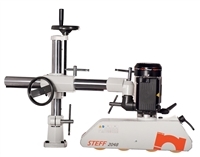 Known for high quality and reliability, STEFF feeders are the professional’s choice for woodworking applications. 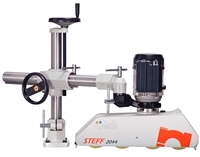 STEFF Automatic Power Feeders are available in 3, 4 and 6 roll configurations in 4, 8 or variable speed models. A belted “tractor type” feeder is also available for short stock applications. Our universal support stand allows the feeder unit to be positioned in a variety of configurations. 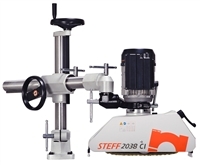 STEFF Automatic Power Feeders allow even an unskilled operator to work safely since the need for hands and fingers to be near the cutting tool is virtually eliminated. Furthermore, as the rollers/belts hold the stock in place, kickback possibilities are practically eliminated. Also, the finish cut of your product is uniform and free of defects associated with uneven stop/start feeding of your product. STEFF Automatic Power Feeders and spare parts are in stock and ready to ship. Please contact us for additional information or place your order and we will ship to your location today. Industrial Power Feeders for Table Saws, Spindle Shapers, Jointers, Sanders, Routers, and Planers. For more details on the items we sell you can download the full manuals which are in PDF format. These two files are zipped up and can be downloaded here. CLICK HERE TO DOWNLOAD MANUALS.